Beard trimmers are almost every guy’s best friends. However, when it comes to finding the perfect beard trimmer for yourself, it can be a very tough decision. You have come to the right place for the solution you need. As avid users of beard trimmers, we are about to introduce to you the best electric beard trimmers in 2019. The first favorite and recommendation from us is the pro premium hair trimming set from TRYM. This 11-piece kit is quite versatile. It includes all the grooming tools you need to keep your beard, mustache or hair at your preferred length. Looking so sleek, this electric beard trimmer uses stainless steel blades of the highest quality. Comes in 7 comb attachments, the high-velocity motor is powerful enough to deal with all kinds of hair (thick hair, long hair, heavy hair or even wet hair). Plus, these tough guys can work continuously for an hour when fully charged. Philips Norelco one blade electric trimmer is capable of completing 3 necessary tasks – shaving, trimming, and edging hair of any length. The dual protection system of this electric beard trimmer is designed to ensure comfortable shaving at all time. And, there is no need to worry about skin irritation because this product does not shave too close to your skin. At a great value, this trimmer has washable heads for easy cleaning and a number of length options all in one razor. One of the best features of this gadget is its durable battery that can last for about 3 weeks when used 3 minutes a day. And, the comb that this razor comes with is totally a bonus. Highly recommended indeed! There is so much to write about this beard and head trimmer series 5100, but we will keep it short by highlighting only its best features. 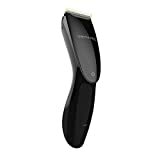 Equipped with the Dynamic Beard Guide system, this high-performing beard trimmer has an innovative lift and trim technology capable of lifting and guiding hair for a more effective cut. Its battery, being lithium-ion battery, lasts for 70 minutes once charged for an hour. And, you can always trust the self-sharpening steel blades to never hurt your skin as well. As an award-winning beard trimmer, this little guy is a highly durable, sharp electric trimmer. Its 45-degree angle stainless-steel blades can cut your beard to perfection in no time. The special rubber grip of this electric beard trimmer delivers you the best beard cutting experience of total comfort and control. Besides, the battery can work for about 50 minutes per charge. Designed to be travel-friendly, the Panasonic Beard trimmer comes with a charging brush, AC charger and universal voltage. Give this electric beard trimmer a rinse in warm water, and it will be clean as new. The next item is Philips Norelco Multigroom Series 7100. With this purchase, you are getting 8 tools for grooming your beard, face and body within a single package. 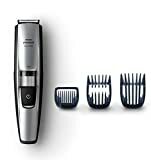 The tools include a full-size metal guard trimmer, body groom shaver, body-trimming comb, hair clipping comb, beard comb, stubble comb, precision trimmer and nose trimmer. The battery has a decent run time of 60 minutes per charge. Once again, while being able to handle thick/long hair gently, its blade tips and combs always prevent skin irritation, too. This is one of the most versatile trimmers in the market, designed to groom the entire body from head to toe. With the boasting high carbon steel blades, this trimmer’s primary ability is to trim, shave, detail, outline and touch up while maintaining its sharpness. To keep it shiny and clean, using a damp cloth would do. Another recommendation from us is the beard trimmer series 3500 from Philips Norelco. Some of the top features of this electric trimmer are its long-lasting battery (120 minutes of runtime), self-sharpening titanium blades, and washable heads. With these features, you can easily achieve a skin-friendly cut and keep the trimmer clean always. Here is another top-notch multi-groom trimmer because we can never have enough of this brand. 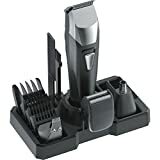 At such a great deal, this set includes a number of useful tools such as a nose trimmer, detail trimmer, mustache trimmer as well as a stubble comb. The chromium self-sharpening steel blades are long lasting, and they can deliver the highest possible performance. Its rounded blade tips help prevent skin irritation, too. This trimmer has 18 built-in length settings and should last 35 minutes before needing a recharge. 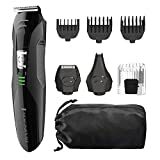 Talking about all-in-1 grooming kits, this electric trimmer set from Remington is totally a worthy purchase. 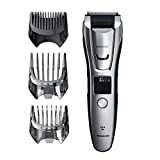 The electric trimmer set includes a hair clipper comb, beard and stubble combs, nose and ear trimmers, and a detail trimmer. And, the self-sharpening, surgical blades of the trimmer are highly durable. All of its attachments are washable, and very easy to rinse. For battery, this electric beard trimmer lasts an estimated 65 minutes of runtime. After delving into the best beard trimmers available today, have you found the perfect electric beard trimmer for yourself yet? At such great offers, it’s definitely time to throw away your old shoddy trimmers now. Do yourself a favor by investing in a good trimmer or trimmer sets reviewed above for better looks and a more efficient lifestyle.